LG Electronics - LP1014WNR : Portable Air Conditioner Review • The Air Geeks, reviews of air conditioners, dehumidifiers and air purifiers. Are you looking for a suitable air conditioner for your room? The LP1014WNR is a 10,000 BTU portable air conditioner that ensures that your living room, office, bedroom, et cetera has the desired environment. This unit doubles as a dehumidification unit to ensure that your room is free from excess moisture. In addition, it offers an intuitive user interface that allows you to adjust the environment of your room with ease and convenience. Considering that you could be interested in this particular air conditioner, we are excited to inform you that we have compiled all the information that you need to know about it. We have researched to provide you with reliable and unbiased information. Do you want to know if this unit produces excess noise or heat? Or are you interested in knowing its merits or demerits? We have gathered enough information to help you make a wise decision. Without further ado, let us start with its features. The LP1014WNR is a strong air conditioner that delivers a capacity of 10,000 BTU. It is suitable for relatively small and medium-sized rooms. Although the manufacturer indicates that this unit is suitable for rooms that are as large as 300 square feet, we have noted that it works best in smaller rooms. Excess moisture promotes the growth of mold and mildew and may destroy your household possessions. This portable system is capable of pulling up to 2.6 pints of water per hour from the air in your room. This ensures that the air in your room is cool and free from high levels of moisture. If you are looking for a system that will transform the environment of your room, then you need to consider this air conditioner. In case you are looking for a system that you can move from one part of your house to another, then the LP1014WNR is a suitable option. This unit has caster wheels that enable users to move it with ease. In addition, this unit features an LED display panel and offers 2 cooling speeds and 2 fan speeds. Furthermore, it comes with a remote control that allows you to control the environment of your room without going to where the unit is positioned. Its 24-hour on/off timer allows you to preset its activation and deactivation thus allowing it to control the environment of your room even in your absence. Does this unit restart automatically after a power outage? Yes, this air conditioner saves its settings and restarts automatically when power is restored. You therefore don’t need to reset the unit manually. Where do you intend to place this air conditioner? We have observed that this unit produces a loud sound. It may therefore not be a suitable unit for use in bedrooms and other quiet places. The LP1014WNR comes with a windows kit that fits in most standard windows. Nevertheless, we have observed that it may fail to fit in many windows. If your window is unique, you can easily do a modification to ensure that the kit fits. Effective cooling and dehumidification. We have observed that this unit blows a lot of air compared to other brands of same capacity. This enables it to cool a room within a short time. However, for better performance, your room should be smaller than the recommended size. Easy to install and maintain. We have noted that it can take you less than ten minutes to unpack and install the unit in your room. In addition, this unit has minimum maintenance needs. Produces a loud sound. Most home appliances that have a fan and a compressor produce sound. However, we noted that this unit is louder than most units of same capacity. Window kit does not fit well in some windows. 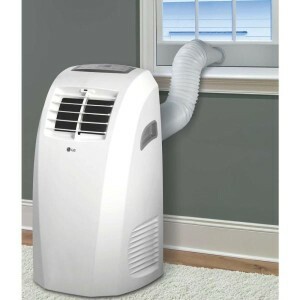 It is important to consider the design of your window before selecting this particular air conditioner. However, you can improvise to ensure that the kit fits in your window. Unit came very quickly. Less than buying at Home Depot when all costs were decided. Love Amazon Prime. Now for the unit. VERY nice looking unit. Stylish and classy. I was a bit afraid of the noise from some of the reviews but it is not bad at all. IT IS AN A/C UNIT witha COMPRESSOR and FAN! It won;t be silent. But it is far from bothersome. We live in AZ. 112 yesterday when we set it up. Took our bedroom from 80 to as cold as we wanted in a couple hours. We have Vaulted ceilings. These should be rated on CUBIC FEET, Not S.F. 300 sf at 13 feet tall is a lot more cooling than 300 s.f. at 8' ceiling. It worked great and we were able to stay under the covers all night. No need for my white noise machine or the fan. The wife said it was a little loud for her sleeping desires but I know it won't take long to get used to. Now for the setup. Easy. We have a 5-0 tall window and that is the MAX. But it works. We did not receive enough Weatherstripping. I will have to buy a little more." The unit works fine. I would guess the installation only took about 10 minutes, including unpacking and lugging it up a flight of stairs. The window installation kit is easy to use--just put the included foam tape around the edge of the window. The plastic installation plate then sits in the foam tape to maintain a seal (not airtight but as close as necessary). The installation plate is expandable by just sliding the interconnecting plates. The exhaust hose fits into the plate. Could not be easier. The only problem I have is the item description is wrong. This unit is designed to be used in a 300 square foot room--the box is clearly labeled and the instructions also say 300 square feet. The Amazon item description says 400. That's a big difference. This looks to be Amazon's error so buyer beware. I'm giving a 5-star review since this would be fantastic if used in a room it was designed for. It does produce a good amount of noise. Its a little louder than a box fan running on high. I did not find the noise to be a problem. Like I said, the unit works fine. I may still have to return it due to needing more cooling capacity." The LP1014WNR is a sleek air conditioner that effectively cools and dehumidifies small and medium rooms. This unit offers a remote control and a timer to allow you to control the environment of your room with ease. 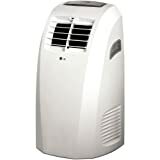 Despite its impressive features, we have observed that this unit is noisier than most air conditioners of same capacity. In case you don’t intend to use this unit in a quiet room, then this may not be a big problem for you. We also observed that this unit is more expensive than some higher capacity units as it costs $690! For the Air Geeks, not as great value as some competitor products – but a good product still!